Good weather again today but the valley between Ghasa and Tatopani is a deep one and the views of the big Annapurna peaks were limited. It was a tougher walk than any of us were expecting -Jangbu's hand wave description of the route did have up as well as as down strokes - but was an excellent one none-the-less. Started the day by speaking to a couple of German sociologists, I think from a charity, who complained to me that since their last trip 20 years ago tourists had destroyed the valley. I guess that annoyed me, and I spent the whole day in an imaginary debate with them about the role of tourists in the valley's very obvious transformation. Our mid-morning tea stop fuelled the internal debate still further. The woman who prepared our tea ran an immaculate little farm, tiny patches of terrace no bigger than a large garden. The location, at the side of the old trail and not the new road which was on the other side of the valley, was perfect. Everything was pristine and clean. She lived in a 25 by 8 foot dwelling made of woven panels of dried grass and a pitched roof made of similar material but with a plastic lining. The dwelling was in two parts, a living area at the front and a sleeping area at the back. She prepared hot water for our tea on a fire which was in a hole in the ground in the living area. There was no chimney and smoke from the fire hung in the low space of the hut. The woman looked after her granddaughter, a four year old. The woman's husband had left her, a son was working in Kuwait, and another son was down the valley at school. Her little farm, particularly with the sun shining, looked wonderful but given the choice the Nepalese, like everyone else born into such a tough life, seem to want something easier. As we left Jangbu nudged away a water buffalo who was pulling at the grass panel walls of the house. At one level you can't help but agree with the German women, tourism is party to a destruction of a way of life that makes the Annapurna so interesting to visit. It demands facilities and services that the Nepalese have not traditionally used or even needed. This includes the food, accommodation and of course the road. 22 of the 24 million Nepalese eat Dal Bhat twice a day but on the Annapurna Circuit you now get a Nepalese interpretation of virtually every cuisine in the world, none of which is eaten by the Nepalese themselves. 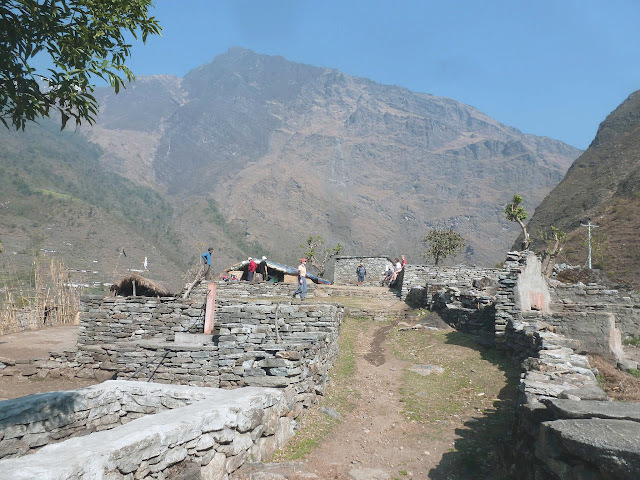 Tourism seems like an ugly, almost colonial intrusion into the Nepalese way of life. However while I can't speak for the Nepalese I think it's probably wrong to paint them as victims. The cut throat business of the tea house operation seems to me to be Nepalese and the often incredibly dangerous task of building the road is something the Nepalese are doing and not without a certain sense of satisfaction. I suspect the countryside in Nepal is going to be transformed in the next thirty years or so, just as it was transformed in Spain in the sixties and France in the twenties. Drawing comparisons with modern western countries may seem fanciful but the dynamic of people seeking a better life is the same. Still those Germans did have a point even if I didn't really agree with it - tourism can be ugly. Our tea house at Tatopani was busy with two large parties of Russians. They were drinking lots and passing round enormous joints, just slightly intimidating, and the atmosphere created was different to the one we had enjoyed with the multinational community of trekkers we had been part of further up the trail. Things didn't really improve in the hot springs below the Tea House. Two pools, one hot and one unbearably hot. To escape the noisy beer drinking Russians we all sulked in the unbearably hot pool. Things picked up at dinner however. Despite dodgy rooms with dodgy plumbing, the Nepalese tea house was a slick operation and even with the numbers, upwards of fifty people, we got the best food of the trip so far. The two Germans by the way were no where to be seen, not walking, they had escaped by taxi.